– Nazem Kadri put the Maple Leafs on the board with a goal at 19:34 of the first period and later picked up the secondary assist on Nikita Zaitsev’s second period goal before scoring Toronto’s fourth goal of the night at 2:10 of the third period and completing his hat trick with the fifth Maple Leafs goal of the night at 10:15 of the third period. Kadri has six points (4-2-6) over his last four games. He has two multi-goal games and eight multi-point games in 2018-19. Tonight’s game is Kadri’s fifth career NHL hat trick (Last: February 14, 2018 vs. Columbus). – Nikita Zaitsev scored the second Toronto goal of the night at 13:11 of the second period. Zaitsev’s goal is his first of the season and first point on home ice this season. He has three points (1-2-3) over his last four games. 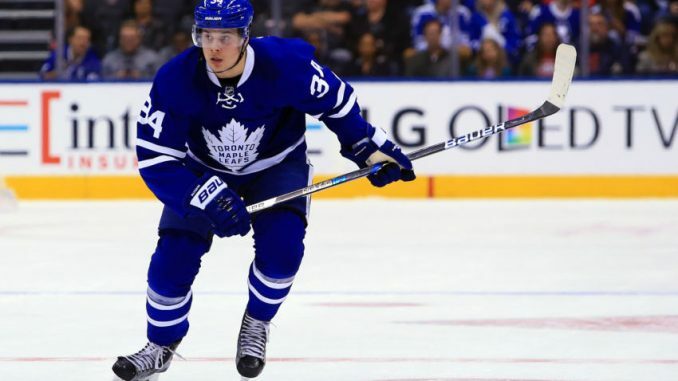 – Auston Matthews scored the Maple Leafs’ third goal of the game on the power play at 16:19 of the second period. Matthews leads the Maple Leafs in power play goals (8). He has three points (2 goals, 1 assist) in two games against Washington this season. – Mitch Marner scored the sixth Toronto goal of the night into an empty net at 19:27 of the third period. He has points (1-1-2) in two consecutive games and seven points (5-2-7) over his last seven games. – William Nylander registered the primary assist on Kadri’s first period goal and later recorded the primary assist on Zaitsev’s second period goal before picking up the secondary assist on Kadri’s second third period goal. Nylander has assists (4) in two consecutive games. Tonight’s game is Nylander’s second multi-assist and second multi-point game of the season. With three assists, Nylander establishes a new career-high for assists in a game (3) and ties his career high for points in a game (3 – 7x). – Morgan Rielly collected the secondary assist on Kadri’s first period goal and later registered the primary assist on Matthews’ second period power play goal. Rielly has four assists over his last five games. Rielly’s second assist is his 50th point of the season, marking the second time in his career he has reached the 50-point mark (Previous: 2017-18, 52 points). Per NHL Stats, he is the first Maple Leafs defenseman to post consecutive 50-point seasons since Tomas Kaberle (2005-06 to 2007-08). – John Tavares had the secondary assist on Matthews’ second period goal. Tavares has points (1-1-2) in two consecutive games and four points (1-3-4) over his last four games. – Connor Brown recorded the primary assist on Kadri’s first third period goal and later added the primary assist on Kadri’s second third period goal. Brown has registered eight of his 14 assists against Metropolitan Division opponents this season. Tonight’s game is Brown’s third multi-assist and fourth multi-point game of 2018-19. – Martin Marincin picked up the secondary assist on Kadri’s first third period goal. Marincin has two assists in his last five games. – Frederik Andersen stopped 41 shots to earn the victory. He is 11-2-0 when making at least 35 saves this season. – The Maple Leafs are 14-11-1 at home this season. – Toronto’s all-time record is 63-69-10-4 in 146 games against the Capitals and 38-26-6-1 in 71 games played in Toronto. – Toronto is 18-10-2 against the Eastern Conference this season and 11-4-0 against the Metropolitan Division. – Tonight’s attendance was 19,148. – The Maple Leafs were 0-for-1 on the penalty kill and 1-for-1 on the power play tonight. Toronto is 11-7-0 when allowing one power play goal this season and 9-5-0 when scoring a power play goal. – Toronto is 8-12-1 when their opponent scores the first goal of the game. – The Maple Leafs are 6-6-0 when tied after one period and 23-0-0 when leading after two periods. – Toronto is 17-7-2 when outshot by their opponent. – The Maple Leafs are 4-1-0 in Wednesday games. – The Maple Leafs won 57 percent (8 won, 6 lost) of their offensive zone faceoffs and 74 percent (12 won, 5 lost) of their defensive zone faceoffs. – Ron Hainsey and Morgan Rielly started 26.7 percent of their shifts in the offensive zone, which was the lowest percentage among Toronto skaters. – Morgan Rielly was on the ice for a team-high in Toronto shot attempts-for at 5-on-5 (39). Rielly had a team-high 5-on-5 shot attempt percentage of 60.9 percent (39 for, 25 against). – John Tavares won 69 percent (11 won, 5 lost) of his faceoffs when matched up with Washington centre Nicklas Backstrom. Obviously, good. I really liked our first penalty kill and the thing ends up in our net. I thought our guys had done a great job. That’s unfortunate. We had a good effort tonight and good for guys to be rewarded. I thought Brown and Willy [Nylander] and Naz [Kadri] had a really good night for them and it’s good for all of them to feel good. It’s important for Willy, but I think important for Brownie and Naz as well. They were a really important line for us. I thought Tavares’ line with Kapanen did a real nice job against the [Backstrom] line there with [Ovechkin] on it and obviously, they’re a handful. That was important as well. We had lots of guys on deck tonight and found a way to win. Just being competitive and winning battles. On one goal, before they scored, he tracked all the way back and got another one, won a battle just inside the blueline at the defensive circle. The reason you play in the O-zone is you win battles all over the ice so you can play in the O-zone. That line was really good. They were fine. It was good for Matty to get one, he got one on the power play. I thought the power play was really good, Tavares won a bunch of battles to get the puck back there. I thought that was good. I thought we had lots of good players tonight. I don’t know. I haven’t watched the game, I’ll go through it and see what happens. I’d like them to have fun, I’d like them to not think about hockey and I’d like them to work out enough so that when they arrive back they’re ready to go. It’s always nice to make a good stop early. You come in and play and try to battle and enjoy the game. It’s a fun one to be in and that’s a really good team. It’s nice to see we played well and came up with a win. It’s another really good game. I think we showed again we can play with these top teams in this league and we’ve just got to try to do it more often and more consistently. I think once we put in that kind of work we can play with anybody. It’s nice to head into the break with a good feeling. Hopefully we can rest up and get ready. Still the same, really. It’s always nice to get some breaks and get some bounces. Early on in the game, when you catch a break like I did just crashing the net, you know it’s going to be a good one. Happy to get the win. That was quite the fortunate bounce (off the crossbar). It wasn’t spinning at all or anything, it was just laid up right on the tee for me. I just felt like, stay positive and stay with it, like I’ve been telling you guys. I haven’t really been super frustrated or anything. Just trying to have a positive mentality and be a good teammate, and good things happen. Yeah, I think we played a pretty complete game. We were skating and didn’t give them much space, especially to their good players. I think we made it pretty hard on them. Obviously, we were fresh so that helps a little. It felt pretty good, especially going into the break. Kind of take your mind off of it a little bit, enjoy San Jose, enjoy the couple days you get off and just get your mind off of everything. I think we got a lot of bounces for us tonight. The first one bounced out front to Naz [Kadri] and he was able to poke it in, the one where [Brown] hit the double posts and bounced out to Naz, but I think we were working and we deserved some of those goals. Yeah, I might not have wanted the break right now. It’s a good break here and come back recharged. Is Vin Diesel Becoming A “fast & Furious” Diva?